I hope you safely received my letter from Santa Cruz. I enclose a copy of my diary up to this date and shall post it next time I go on shore. I hope you will be able to read it – it is written very small in order to get in as much as possible. We hope to leave this port shortly, but all depends on the weather – sometimes vessels are detained a week or 10 days by adverse winds which prevent the coaling going on. If the weather continues as it is now, we shall get away tomorrow evening or Friday morning. You will see by my diary that I have enjoyed myself much during our short stay here and also at Teneriffe. There are emigrant vessels here from all parts of the globe – they touch here for coal and provisions. The streets of the town are thronged with emigrants. I have conversed with several of them, and find that generally speaking, the arrangements on board are not as good as people are led to expect from the advertisements. I am on the best of terms with the officers one and all – we get on famously. I have amused myself with taking portraits of them in pencil which they all pronounce very successful. I have promised to sketch the captain and his little son. Our chief officer, Mr Munro, is a most entertaining fellow. He has been at sea for upwards of 25 years and seems to know the whole world. His adventures would fill volumes. He is a rolling stone, or he would have had a command years ago. He has been in the navy in sundry merchant services and in the Portuguese service. The P&O company will shortly give him a vessel – I thought much of you all on Xmas day – it was rather dull on board – there was much confusion as we were entering the Bay – you will of course send my diary to Shelton and London. It is better than for me to send repeated accounts to them. Letters cannot be prepaid here. With love to yourself and all the party at home and kind remembrance to all friends. The sea suits me admirably. I have not had an ache or pain since the seasickness. Finished writing home this morning. Paid a visit to the Steamer “Melbourne” with Mr Munro and Mr Angrove. She is in a very dirty condition – about 60 passengers on board. She started from England with 200 but several left the ship at Lisbon where they had put in to repair damages. Made sketch of Table Mountain and Cape Town from the “Bentinck”. Coaling was finished this afternoon. Coolies went on shore singing and with colours flying. Fireworks in Cape Town this evening. Blue lights burnt in many of the ships at midnight accompanied by ringing of bells and cheering of crews – to welcome in the new year. We had many visitors from shore during the day. Tomorrow being New Year’s Day, is kept as a general holiday in Cape Town – not a man will work. Consequently we shall be detained until Monday for water and fresh provisions. Went on shore about noon with Mr Brown, called on the Captain who invited us to dine with him at 7. In strolling about town we met Mr. Saunders, the Editor of a newspaper with whom we became acquainted on our arrival. He invited us into his Sanctum and produced a bottle of sherry by way of tiffin, to which we did justice. All the shops are closed today and the people are in the country, “making a day of it”. After some trouble, we succeeded in hiring a vehicle to take us to Wynburgh, a village about 8 miles from Cape Town. A pair of greys and handsome Phaeton – Hottentot driver – quite a first rate turn out. One of the pleasantest test drives I ever enjoyed. The country we passed through is very beautiful, dotted with villas and country residences of the Grandees, These villas are surrounded by flower gardens, quite English in appearance, and are approached through splendid avenues of Oak and Fir. 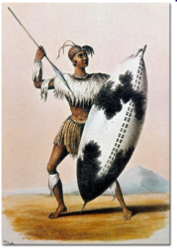 On our return to Cape Town we went to an exhibition of Zulu warriors. Twelve of these dark skinned gentry are going to England to form an exhibition and are being shewn here for a few days before their departure. It is a speculation of some Captain’s I believe. Their costume consists principally of feathers and horse hair. They performed sundry outlandish dances and sham fights. I thought the whole affair rather disgusting. We adjourned to the Captain’s lodgings about 7 and dined. Met several people at dinner – some had arrived today from Jamaica, they had been 103 days on the passage, having been becalmed; they are bound for Australia. At 9 o’clock left to meet our boatman who took us on board for 7/6 [37 and a half pence] (this is considered a low price for taking you off at night). It was blowing very hard and the man would not go alone – no-one would accompany him – so we were obliged to remain on shore to my secret delight for I did not half like the appearance of the sea. Mr Brown was rather vexed because of his duties on board. After trying 2 or 3 places, we obtained bedrooms at Welsh’s Hotel – a most comfortable place, and at present, like all the other hotels, quite full. We had a cosy little supper, waited on by a sprightly Hottentot, and turned in about 11, giving orders for the boat to be in readiness early. (The “Melbourne” left today for Australia. Hottentot waiter brought us coffee at 6 this morning. We were dressed by 7 and found our boatman waiting for us – got on board in time for breakfast at 9. My friend the doctor read the service today in the Captain’s absence. Some of the officers went on shore. An easter [wind] came on and they were obliged to remain all night. Captain and Mrs B came on board at noon. Weighed anchor and left Table Bay at 2.15. Our saloon cook being dangerously ill we left him in the Hospital in Cape Town. Passed several vessels this morning. Very heavy sea today. Played backgammon with Mr. Green this evening.